Treve, still unbeaten and representing trainer Criquette Head-Maarek, showed an exceptional turn of foot in destroying a quality field to win the Prix de l'Arc de Triomphe. Ridden by Thierry Jarnet in the absence of the injured Frankie Dettori, the filly smoothly took the lead coming down the straight and soon put daylight between herself and the opposition. Try as he might, the Japanese-trained favourite Orfevre could not get to her and just as last year, he had to settle for second place, with Intello finishing third and another Japanese challenger, Kizuna, in fourth. Treve had been drawn in a supposedly unfavourable stall 15, although Head-Maarek staunchly dismissed the importance of her starting berth in the build-up to the race, and her feeling proved right. However, her wide draw meant Jarnet struggled to get early cover as Joshua Tree set a steady pace up front. But while she was keen in the early stages, Treve made stealthy progress down the outside and appeared to be thoroughly in control as she loomed up on the turn for home. Jarnet only had to give the signal and the Sheikh Joann Al Thani-owned filly kicked clear and never looked like stopping in front, with the jockey easing up to celebrate as he passed the line with a five-length lead. It was a further neck to Intello. Head-Maarek said: "I want to say thank you to Frankie Dettori as he rode an amazing race on her in the Prix Vermeille. I said to save her for today and he did. A big kiss and thank you to Frankie, I am sorry he is not here today. "She won so well, the way she won was incredible. She got no cover and had to come on the outside the whole way. When horses are that good numbers (the draw) make no difference and the ground makes no difference. "The jockey said she was travelling so easily he just let her go. I'm so proud for papa (Alec Head), who bred her, and for the Sheikh. When he bought her, he said 'I want you win an Arc'. I said 'I cant promise, but I'll do my best'." Asked if it was the highlight of her career, she replied: "Of course. To win with a filly is extra special." Alec Head said: "I trained some great horses, but this one is really super." 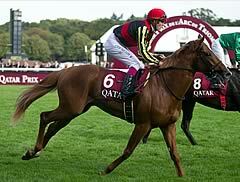 Criquette Head-Maarek has confirmed Treve will stay in training as a four-year-old to defend her Longchamp crown. A trip to Hong Kong later this year is still under consideration, although far from certain, and Head-Maarek is already dreaming of back-to-back Arc victories in 12 months' time. "I am with her in the paddock now and she looks beautiful. She ate up everything last night and hasn't lost any weight. She is just an amazing filly," said the trainer. "She won the race very easily. They pushed her to the outside but when she came there in the false straight, I knew she was going to win. "I know Thierry Jarnet's riding very well, I could see he had a lot of horse underneath him and when he let her go, they were never going to catch her. "It's her turn of foot that is so unbelievable. When you look at the times, she ran the last 400 metres faster than the winner of the Prix de l'Abbaye and the Foret, which is incredible after a long-distance race like the Arc. "She will stay in training next season and I don't think we will run her again this year. If she does have one more run, it will be in Hong Kong as the Breeders' Cup is too close and the ground in Japan is always very hard. Christophe Soumillon admitted Treve was unstoppable on the day after riding Orfevre into second place in the Qatar Prix de l'Arc de Triomphe for the second successive year. Last season the Japanese star was caught in the last few strides by Solemia after looking to have had the race won, but this time he was no match for Treve and trailed in five lengths behind, though he again ran a fine race. The jockey said: "This year he was feeling very well and I was confident, but with the weight the older horses give to the three-year-olds it is quite difficult for them. We had a good run. I would have preferred to sit fifth or sixth with a stronger pace, but I don't think Treve was beatable today. "It's not my decision (if Orfevere will return next year), it's for the team to discuss. It is always difficult to think a horse can come back as a six-year-old, but we will see. I think he's a great champion, but Treve was the top horse today." Aidan O'Brien fielded two Classic winners in Investec Derby hero Ruler Of The World and St Leger winner Leading Light, but neither could make the frame behind the impressive victor. The Ballydoyle handler said: "They've both run good races. It was messy, but they finished off well and they are two nice horses to look forward to next season."